On this day in Duluth in 1952, the “Duluth Eskimos” defeated the Green Bay Packers by a score of 34–7 at Duluth’s Public School Stadium. Of course, at the time the Eskimos did not exist, having folded in 1928—but the Packers held training camp in Grand Rapids, Minnesota, during the four years Gene Ronzani coached the Packers. The “Eskimos” were actually just more Packers: the game was simply an inter-squad scrimmage to help prepare for the upcoming season. Moving the game to Duluth and calling one squad the “Eskimos” helped increase the Packers fan base in the early 1950s, when Minnesota had no professional football team. The year before the Packers won 22–21 thanks to a last-second field goal, and the following year the Packers would take the game 16–3. August of 1952 also featured the same two squads facing off in Grand Forks, N.D., in what was billed as the “Potato Bowl,” the Eskimos won that game as well, 28–7.) Lisle Blackbourn, who replaced Ronzani as head coach, moved the Packers training camp back to Stevens Point, Wisconsin, in 1954. 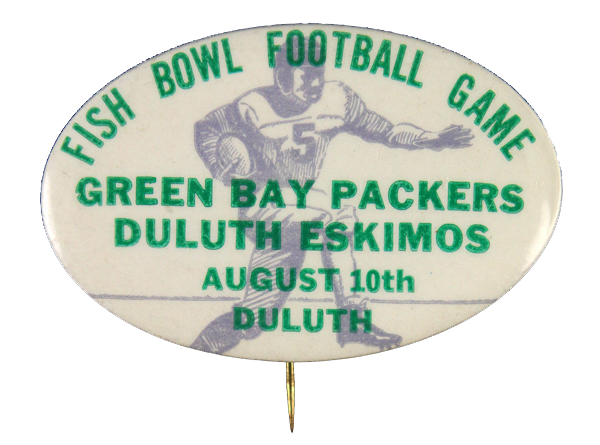 Coverage of the 1952 game billed the event as a return to Duluth’s 1920s glory days in the NFL, saying that “No more bitter rivalry existed in the struggling young pro circuit.” But the Packers never played the NFL Eskimos in Duluth. The Pack came to town twice, playing the Duluth Kellies‚ predecessors to the Eskimos, at Athletic Park. The Eskimos themselves were a dedicated traveling team and played just two home games in Duluth in the two years the team existed. They also travelled to Green Bay twice, tying 0-0 in 1926 and losing 20–0 in 1927. Why were the Eskimos a dedicated traveling team? Find out why, and much more about this legendary team, said to have been “the greatest football team ever put together” and the team that “saved the NFL,” here.